So i finally got a chance to wear my beautiful For Love And Lemons Vika Set! Ive worn both the skirt and top separately but due to the cold weather in England i haven't been brave enough to wear it as a whole. I brought it with me on holiday as i just knew it would be perfect for an evening meal. I wanted to dress it down a little so that i would feel comfortable in it wherever i went, so i paired it with a casual denim jacket and summer wedges, with a pop of colour with my bag. I'm so in love with this bag, its the perfect bright coloured bag as it goes with so much. I was thinking about purchasing a Saint Laurent in a bright colour, so i purchased this Zara one to try it out first to see if i'd actually wear it. So far, so good! Oh and these wedges, they are the most comfortable shoes i have ever worn! They are really soft and padded so I can walk for miles in them. 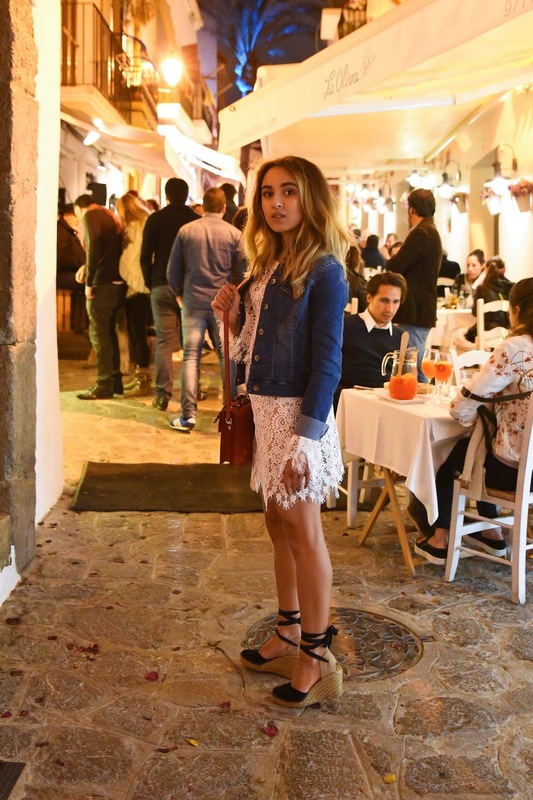 I wore this outfit to a beautiful dinner in a hidden restaurant in Ibiza Old Town. We stumbled across it when walking back to our apartment one day and vowed to go back there the same evening. I'm so glad we did. It was the most amazing, home cooked food with traditional components, cooked perfectly with decadent flavours. I left feeling truly satisfied. It was called La Torreta if you're in the area!